Another artifact, as dangerous as it is valuable, has been stolen from the Hayabusa village. By now you’d think that the village probably isn’t the best place to store all these items capable of destroying the world, especially when the clan’s killing machine, Ryu, is on vacation. 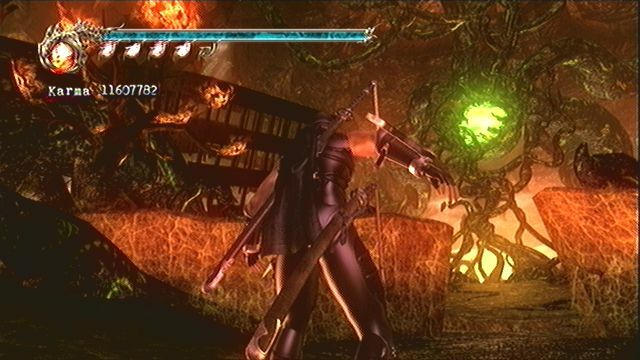 This time the object in question is an ancient demon statue, which the Four Greater Fiends (didn’t we learn in the first Xbox Ninja Gaiden that there are only three Greater Fiends? Now we’re up to seven.) under the command of evil priest Dagra Dai seek out to resurrect the Archfiend and bring the fiend race back on top of the world. What a fiendish plan! Is there really anything more that needs to be said? 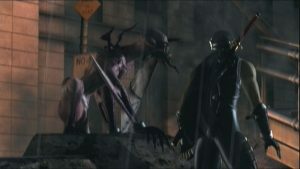 Of course, Ryu sets out to frustrate the fiendish plans and retrieve the demon statue. 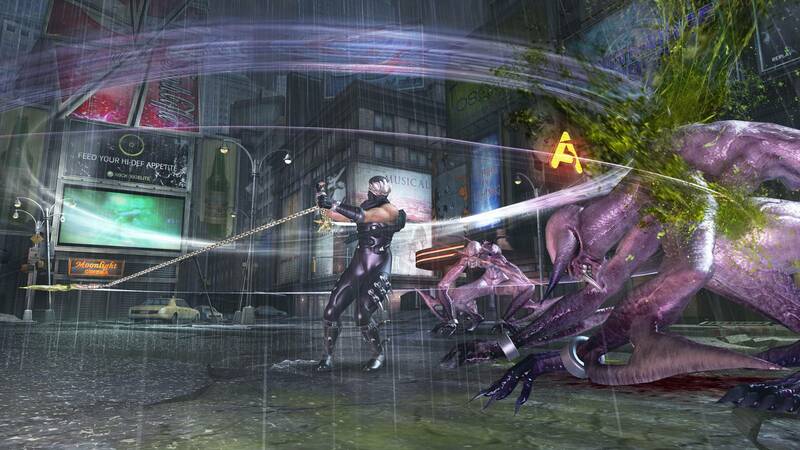 A tough CIA agent who tries to contact Ryu and win him for the battle against the threat of the Archfiend. She supports Ryu during his quest and is as much of a sidekick as Ryu will probably ever have. Once again selling valuable items to Ryu, but he also shows his awesome sword fighting skills for the first time. Ryu’s Father is back from his training but badly wounded by Genshin at the beginning of the game, so we won’t see much of him once again. Leader of the rivalling Black Spider clan. 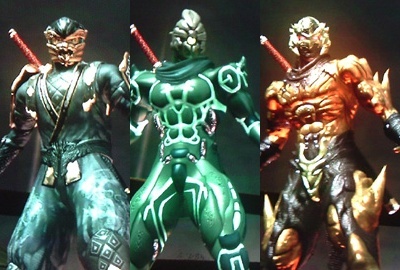 He is the Dragon Ninjas’ personal nemesis, and to defeat the hated Hayabusa lineage he even teams up with the Four Greater Fiends in their quest to revive the Archfiend. She is the queen of the Four Greater Fiends and Ruler of Blood. 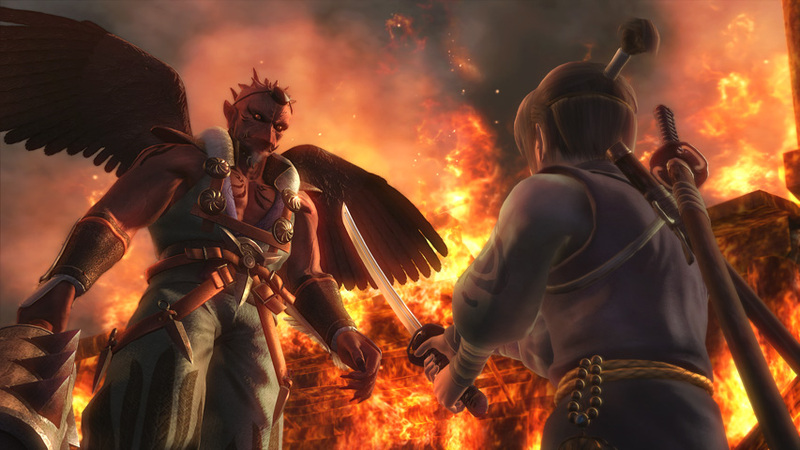 With Genshin’s help, she steals the Demon Statue from the Hayabusa Village to resurrect the Archfiend. The narcissistic Ruler of Lightning and one of the Four Greater Fiends. 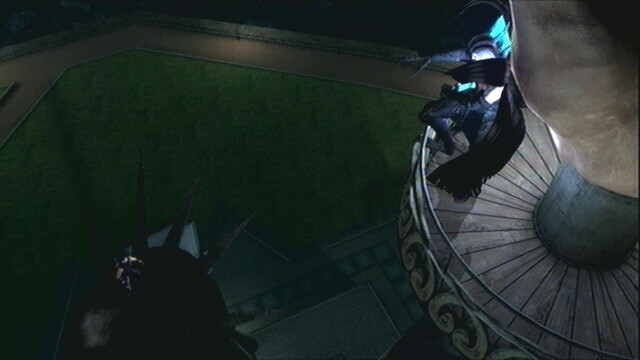 He has barricaded himself inside the Statue of Liberty. The violent Ruler of Storms dwells in a castle in Venice, where he hosts barbarous gladiator fights to find a warrior worthy of being his opponent in the arena. It appears quite comical that his Japanese voice actor is the same as for Bass in the Dead or Alive series. The diabolic Ruler of Flames. He despises humans and claims that they’d be nothing if it wasn’t for him bringing the gift of fire to them in the first place. Her role is little more than a cameo this time. 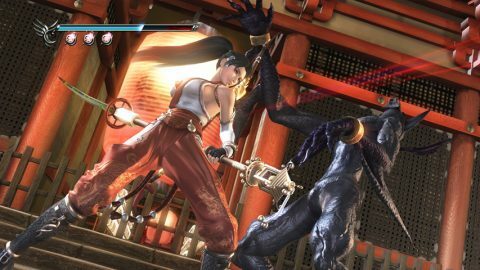 She looks quite a bit older now, suggesting that the game might take place several years after Ninja Gaiden or Dead or Alive(although everyone still treats Ryu as a teenager…). Once a human philosopher, he was turned into a demonic priest through the power of the Archfiend and now commands the Four Greater Fiends. Where did all those people from Dragon Sword go? No one seems to care. Same as always, the story plays but a secondary role to set the stage for epic slaughtering of legions of fiends and ninjas. There aren’t any real surprises, but this purpose is fulfilled nonetheless. There’s a bit more to see of the important characters than in the previous game, and also more story development, but still not quite what you’d call award-winning material. That’s not necessarily a weak point, though. 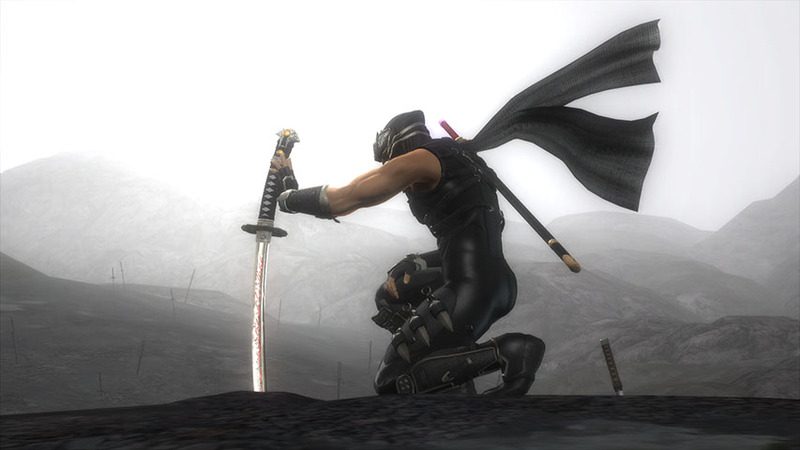 If not through an interesting story, the cinematics convince through great action sequences, which is more befitting for a game about a super ninja. Seeing Ryu jump off a plane without a parachute only to use his sword as a brake on the runway of a flying fortress is preferable over a 10-minute philosophical conversation with the Greater Fiends any time of the day. The action, similar to Dead or Alive‘s follow-up on the Xbox 360, has been made even significantly faster, and – thanks to the new hardware power – Ryu gets to fight sheer armies of fiends and ninjas at once. This time, there’s a lot less healing items available. 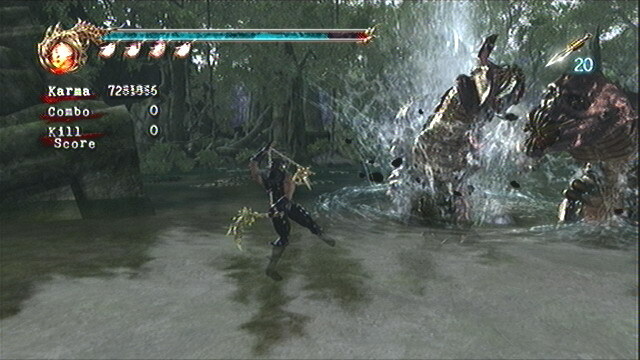 Instead, the system of a partly regenerating life bar and refreshing save points was adopted from the DS game. Extending the life bar through Lives of the Gods will also replenish health as well, which makes it now advisable to save them as precious healing items for tough boss battles. A lot has been done to make the game more enjoyable for less adept players. 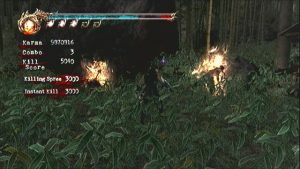 The (semi-)permanent damage taken differs with each difficulty level, so on the lowest one, the Way of the Acolyte, you’ll start most encounters with almost full health, while you have to face much less and weaker enemies than on the higher difficulties. You can also activate a tutorial, which teaches you all the ninja techniques during the first chapter. 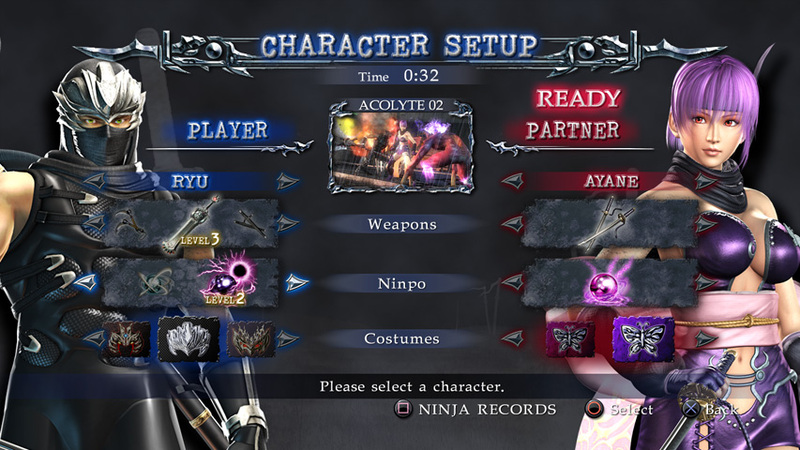 While Team Ninja finally implemented an easy mode, they seemed to have forgotten the normal one. Acolyte is easier than the Ninja Dog mode of Black or Sigma, but the next available one has to be placed somewhere between the former Hard and Very Hard mode, and letting your guard down for just a split second in the second half of the game is almost always punished by death. On the other hand, the Greater Fiends of all things are still ridiculously easy. 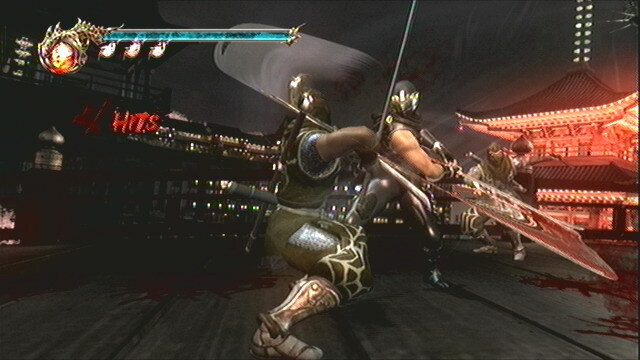 Itagaki once said that he wanted to put more human(-oid) bosses in the game for a more direct one-on-one duel experience, but none of them provides a challenge comparable to the later Ryu clones from Ninja Gaiden Black. And even if you should die in a battle against them, it’s no big deal, because you now can retry them right away instead of having to start from the last save point, which are still rather far away from each other. When talking about the difficulty, all the inappropriate critique that is exercised even by renowned magazines and other people who should know better certainly has to be addressed. The difficulty of the game is often called cheap, also by people who have mastered the first Ninja Gaiden, but that simply has no validity whatsoever. 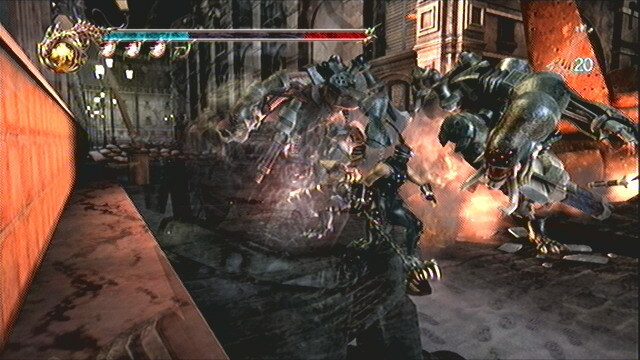 The most common arguments are made about the armadillo boss and the multiple rocket launchers. An awful lot of reviewers complain about the armadillo exploding and surprisingly killing them after he is defeated, which can only be avoided through blocking (or using a Ninpo at the right moment). But in the same level Ryu encounters for the first time enemies that explode upon defeat, damaging him. This he can avoid – you’ve guessed it – through blocking. Then when the boss is blinking like crazy and light beams start to come out of it, how much more telegraphing do people need to take a hint? 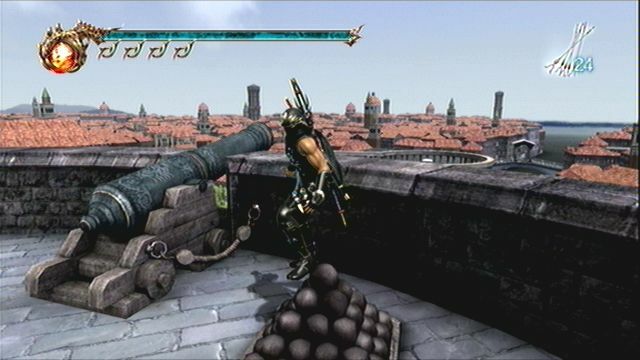 As for the multiple rocket launcher enemies, these are also far from cheap and in fact quite easy to take out once you learn how to approach them, and they don’t force you into ranged combat the least bit, unlike described in many sources. As with the first Ninja Gaiden on Xbox, at least on the first two difficulty levels, there’s absolutely no situation that is not totally controllable when approached with the right tactics. The already great controls have been tweaked even further. A very pleasant change is the separation of the standard attack and interaction buttons, so there’s no accidentally leaving rooms or constantly attacking while you just want to open a treasure chest. 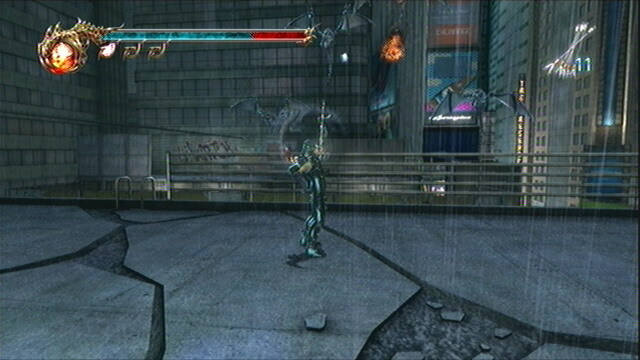 Team Ninja also found a good compromise for the water running. 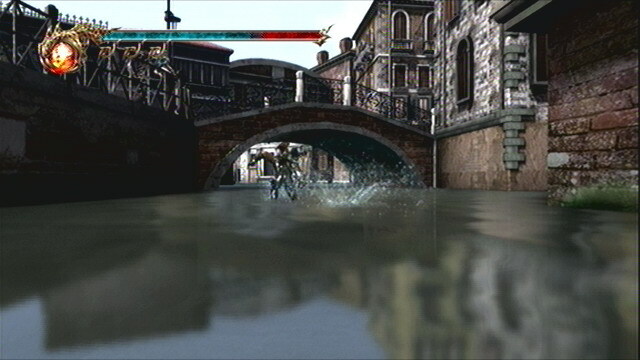 Now you still have to press the jump button for each step on the water, but you can also start running from out of the water and skillfully fight on the water surface. Escaping throws now works much more consistently, but nonetheless, still only a fraction of them are actually escapable at all. The final change to the controls is a mere aesthetic one – instead of performing a roll, Ryu now dashes to the side to avoid enemy attacks. At first, it needs some getting used to, but rolling around all the time looks a bit ridiculous, so the new animation actually makes more sense. Some measures were also taken to try and improve the camera, although with very mixed results. You can sense that there’s some implementation that tries to prevent it from getting into walls, and as the developers stated in an interview, they wanted to level the camera to give players a semi-2D, duel style perspective. The truth is, most of the changes actually make things worse. 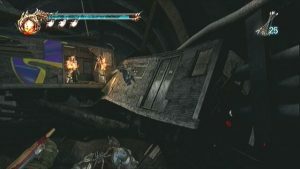 The camera gets stuck every once in a while, and a duel-friendly perspective doesn’t really bring any benefit when you’re fighting legions of enemies most of the time. It’s always for the better to switch the game to 16:9 even on a 4:3 TV, since you often can hardly see anything with the narrow view. Most of the problems can be compensated by placing the camera directly behind Ryu with the right trigger, but it really would have been better if they just left things the way they were. The one good change, though, is the possibility to switch back to the free camera during boss fights, which especially comes in handy during the Path of the Mentor or Master Ninja, where more and more bosses are supported by annoying underlings. For no apparent reason, camera rotation switches to the other analog stick while charging for an Ultimate Technique, which doesn’t make any sense at all and is very counter-intuitive. Speaking of which, the Ultimate Techniques are one of the moves that were greatly enhanced. 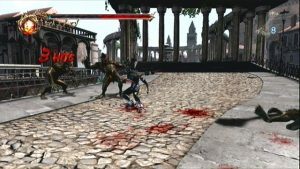 Now ranged weapons can also be charged into these powerful attacks, while a lot of the melee weapons have very mighty ones, and you can still continue to charge them while being hit, so if you’re ready to sacrifice some health for these devastating attacks, you can really tear your enemies apart. 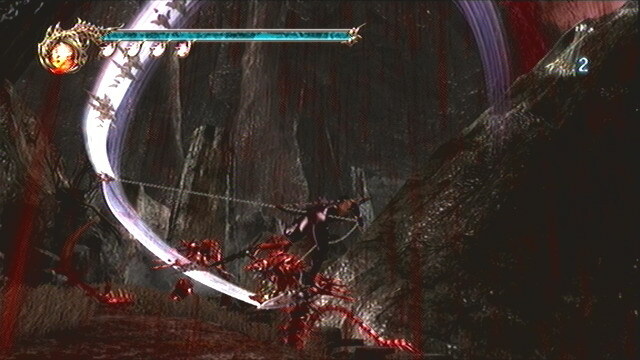 Cutting enemies to pieces, by the way, has become an important feature of the gameplay. Ryu is now capable to completely dismember most of his ordinary enemies, but that doesn’t make them any less dangerous. To the contrary, it makes them go for hazardous desperation attacks like grabbing Ryu just to detonate themselves together with him in a suicide attack. To counter these not-quite-disabled foes, you have a set of gory finishing moves at your disposal, called Obliterations, that are activated with the strong attack button. Together with other gratuitous effects, like fountains of blood, pieces of corpses that keep lying on the floor, burning enemies running around screaming, and Ryu nonchalantly shaking of the bloodstains from his weapons, Ninja Gaiden II is surely one of the most violent and gory games in existence, and they might have overdone things a bit. It’s refreshing to see the proper gruesome consequences for swinging around sharp objects, but there could at least have been an option to tone down the degree of violence for people that can’t or just don’t want to stomach such an amount of explicit slaughtering. 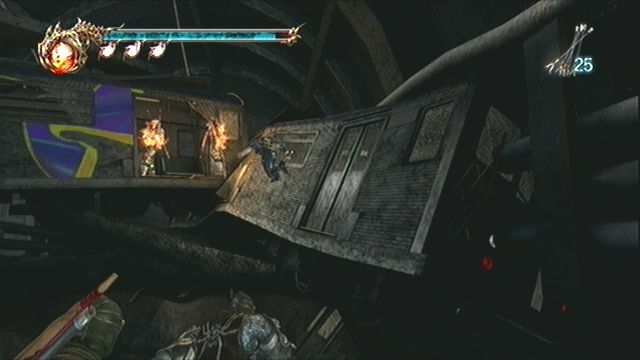 Of course, dismemberments are a significant part of the mechanics, but they could always present them just through disabled limbs without destroying this aspect. On the other end, the violence doesn’t deliver the redeeming qualities it could have, because you only can hack apart ordinary enemies, while the bosses always stay in one piece, although most of them do have their individual obliteration moves to be killed with. This is something done much more consistently in the God of War games. 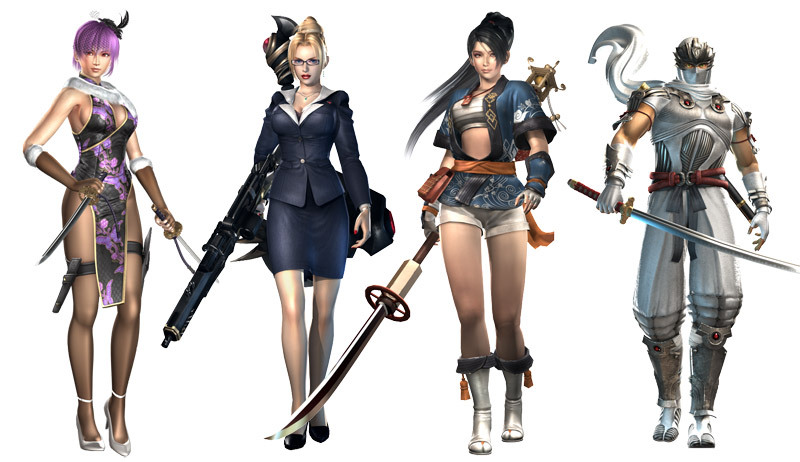 Ryu lost most of his previous weapons, making room for a far more diverse and interesting set of replacements. 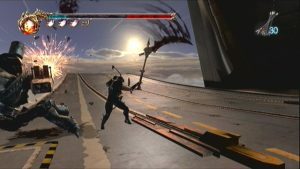 Next to the familiar Dragon Sword, the Vigoorian Flail, the Lunar Staff, and double katanas, you’ll find Wolverine-styled claws (fitting shoes included), a sickle on a chain clearly inspired by Kratos’ blades from God of War, tonfas, and a huge scythe. 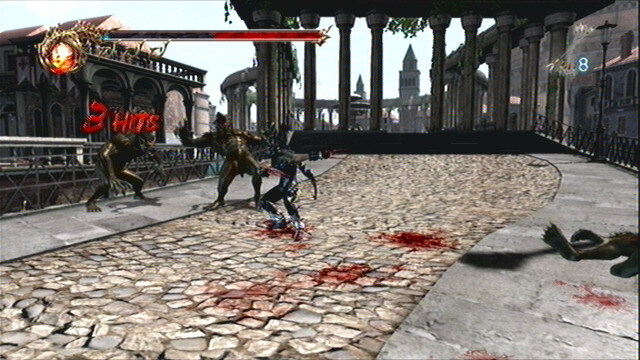 The latter is one brutal hell of a weapon and, sadly, hopelessly overpowered against anything that is not ultra fast. Once again, all of the weapons can be upgraded for sharper blades and longer combos. The Ninpo attacks have mostly been replaced, with Ninpo magic actually becoming useful, or at least it can get if the spell’s level is maxed out. The Art of Inferno now launches multiple fire balls instead of one bigger one, so you’re always getting multiple hits, no matter where your enemies are standing. New are the Flame Phoenix attack, which kinda replaces the Fire Wheel, the Wind Blades, which, at level 3, can kill a whole screen of ninjas in a single strike, and the Piercing Void, a gravity attack. The graphics look generally pretty good, especially the various creatures and their animations, but there’s also some things to be left desired. Instead of adventuring through one cohesive area, Ryu now visits several places on earth, including a revisit to the Hayabusa village, and there’s a much greater variety in the environments thanks to that. While most of the locations – especially the cities New York, Venice and Tokyo – look great, there are also a few less sightly ones, and some downright ugly caves. While there’s some decent enough lighting in some areas, the engine is lacking in certain standard special effects, especially reflections. Even the better looking levels are much less dynamic than action game fans are used to nowadays, and you’ll still come across countless invisible boundaries and obstacles that shouldn’t be obstacles. Interaction with the environment, in other words destructible objects, are also very inconsistent and much too sparse. Why can you destroy the round tables, but not the square ones? Why can you break the display glass in the museum, but no windshields of cars or wine bottles? While these things may not afflict the game itself, they definitely don’t help with suspension of disbelief. Together with the fact the levels are a bit too straight forward, with puzzles or crossroads making themselves scarce, it really lets you feel the linearity. There’s also times where the engine can’t cope with the ridiculously high amount of action on the screen, which can, though rarely, cause severe slowdowns, especially when flame effects are involved. Audio-wise, Ninja Gaiden II is a big improvement. You’ve got a lot of thrilling fight music that dynamically adjusts to the situation, and even some beautiful orchestral theme tunes that would as well suit a blockbuster movie. 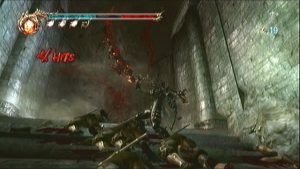 The sound effects are executed in an equally professional manner, and the sounds of squirting blood and screaming enemies accurately support the gory impression of the graphics. Effects like the hall in a cave or frizzling fire provide for a great atmosphere. Once again you it’s possible to choose freely between Japanese or English voice acting, with a wide range of subtitles available. Each version of the game is region code free, by the way, and has all the languages. A duel in front of Tokyo’s skyline. 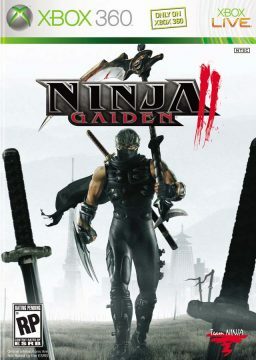 With Microsoft’s construction kit marketing for the Xbox 360 hardware, developers weren’t allowed to assume an installed hard disk anymore, and so Ninja Gaiden II loses all the caching benefits of its predecessor. 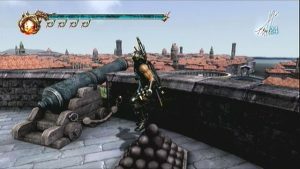 In addition to a medium length loading time for each stage, there’s also points the game has to reload during the chapter, which is done particularly bad. If you happen to be in a battle at such a position, you’ll constantly cross that invisible border, and the game stops every time to reload again and again, which can not only get on your nerves, but just as easily get Ryu killed. Despite the popularity Xbox Live had gained by the time of the game’s release, there’s still no multiplayer duelling mode available. The only online functions available are leaderboards and the new Ninja Cinema, which is actually a great idea, but not executed very well. It’s basically a video recorder you can turn on while playing the game to show the world how awesome you are, but only the 2000 leading players are able to upload their recorded movies, which probably makes sense to avoid spamming with boring and unspectacular videos. The great flaw of the Ninja Cinema is the fact that you have to watch the video just the way it was played. 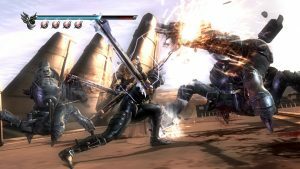 It can neither be paused, nor do you have any control over the camera, which is a serious step back from Team Ninja’s own Dead or Alive replay function. 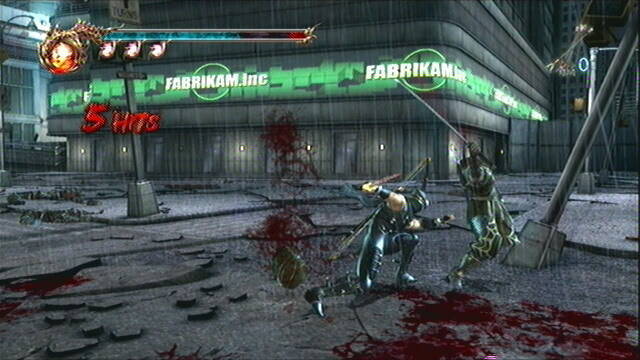 The game is also quite a bit shorter and offers less replay value than Ninja Gaiden Black or Sigma. The mission mode has now been integrated into the main game, with only nine missions in its retail state. These you can also only access if you find a certain item very early in the game. That one isn’t hard to miss, so you should keep an eye out, since the additional items you get through the challenges are the only ones you can’t buy later at Muramasa’s shop if you missed them. The Scarab collectibles have been replaced by Crystal Skulls, but those don’t have any in-game effects and just give you achievements for your gamer profile. The only things unlocked upon completion of the game are equally boring color variants for Ryu’s suit instead of cool costumes, a filter that makes the game look like a silent movie (which isn’t quite as boring, but using it over a long time does get dull, eventually), and a new game plus save for the current difficulty level. These let you start a with all your items and upgrades intact and are also vital for some of the achievements where you have to use the same weapon during the entire game. To lengthen the game experience, Tecmo intended to cash in with new downloadable content. On day one, a separate mission mode with 25 new tasks was available for 800 MS points and a whole bunch of costumes for 200 points each (they all come in five colours), but none of them are particularly exciting and they seem like a waste of money. Attention: The Ninja Gaiden Sigma 2 screenshots on this page are promotional materials and differ in presentation from the actual game. 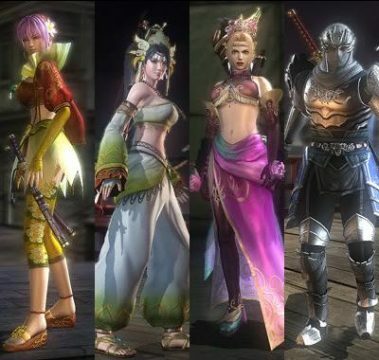 … at least that’s how it seemed in 2008, but a year later Team Ninja – now led by Yosuke Hayashi – had already shaped up again, and presented their newest product, another update to one of their previous games. 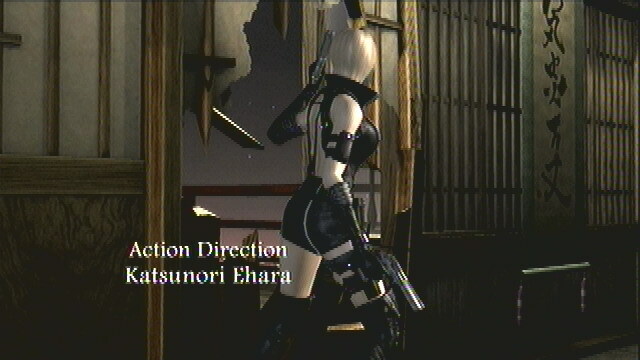 Following the game’s advertisement campaign in Japan, one might assume that this release would be all about female secondary sexual characteristics – the most bizzare piece of advertisement being a pair of curves poking out of a poster wall, with the small game logo in the corner. The main commercial spot shows nothing but male Japanese gamers hypnotized by Ayane’s jiggle. Behind this dubious marketing strategy were the three new playable characters that come with this PlayStation exclusive update. Momichi from the DS game, the fiend hunter Rachel, and playable for the first time in the series, Ayane. All three get a very own new chapter in the form of intermissions between Ryu’s mission (that take place mostly on old maps), all with their cup size adjusted upwards once more. 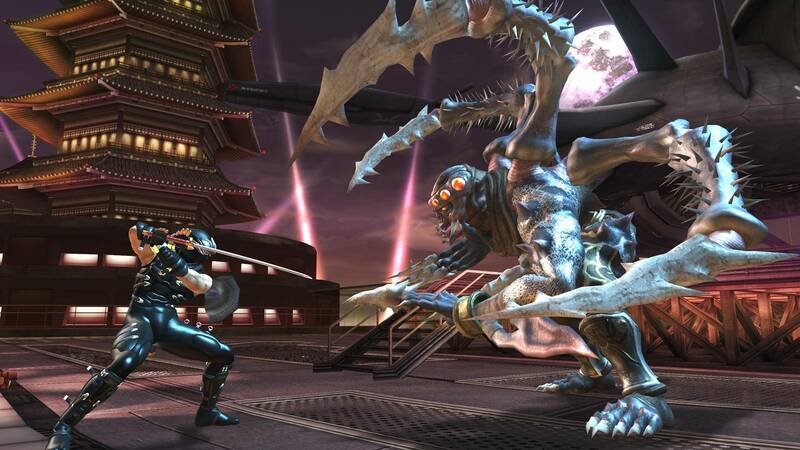 They’re also available for the brand new co-op feature, which brings back the challenge mode in more than full glory. Sadly, it’s online-only, without a split screen option (but the camera probably wouldn’t be able to handle that, anyway). The AI can assume control over the partner, if you can’t find any players or just don’t want to bother with strangers on the PSN. There’s a total of 30 co-op missions, where you get to select the two characters freely. Cooperative gameplay is mostly realized through the ability to revive each other, as well as an extremely powerful combined Ninpo explosion. 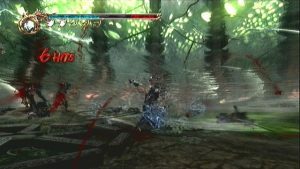 More advanced techniques like saving your partner from an enemy grab, are missing, though. Returning from Ninja Gaiden Sigma, she’s still the rather slow tank-character she used to be. For some reason she was brought back, rather than making Sonia a playable Character. 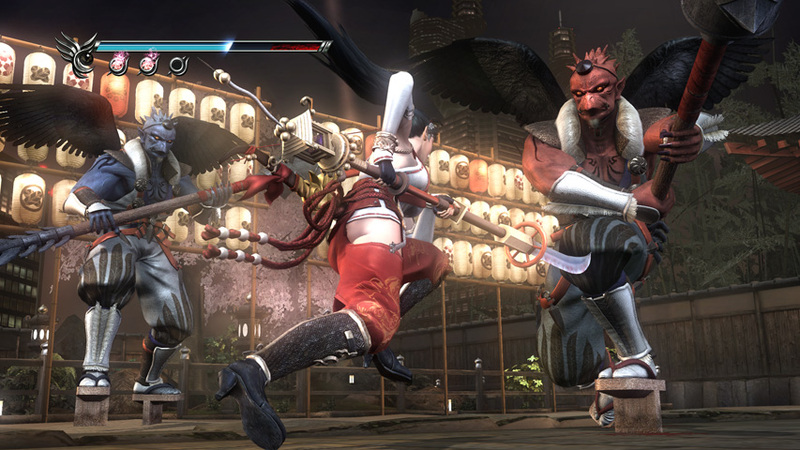 Momiji was also playable before, but only in the prologue chapter (and the Master Kunoichi mode) of Ninja Gaiden Dragon Sword. This time, her main weapon is a naginata. 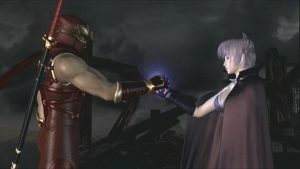 Ayane was the hottest (no pun intended) candidate for a cooperative mode prior to its announcement, since she has a comparable fighting style to Ryu. She is fast and agile, and mostly fights with two small daggers. Basically, Sigma 2 offers more of everything. Well, more of everything except one: Blood. 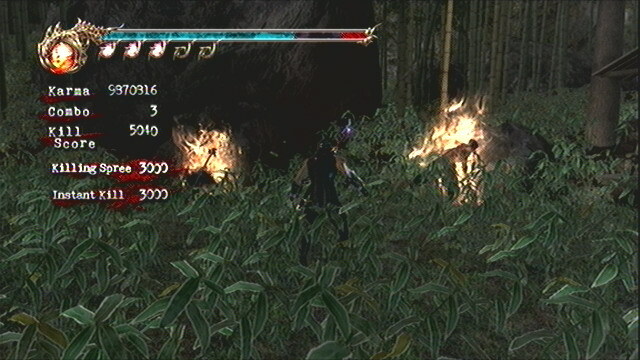 Ryu and his gang still slice enemies into handy pieces, but instead of red fountains, all you see is some strange purple smoke emitting from the vanishing limbs. 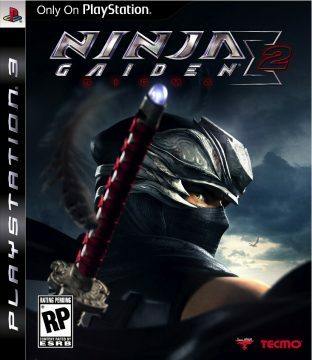 New Team Ninja Boss Yosuke Hayashi liked to babble about how the point of Ninja Gaiden 2 was violence, and now with the completely different Ninja Gaiden Sigma 2 there is another (not or only vaguely defined) point, so of course, we can’t have the violence anymore. But he cannot conceal the fact that Sigma 2 simply underwent a very severe treatment of self-censorship. It doesn’t take away anything from the gameplay, but the action surely seems a lot less tangible. 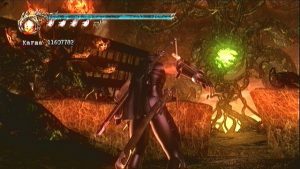 Visual changes are much more subtle than the last time around, but after all, Sigma 2 is a port among the same console generation, other than its predecessor. A few upgraded models here and there, dynamic lighting, pixel shaders, that’s about it for improvements. In turn, there’s even a few aspects where the port is doing a less impressive job. Since the PlayStation 3 has more problems with pushing a lot of polygons, there are significantly fewer monsters around at once, most notably in some of the crowded cut scenes (look here for a detailed comparison between the two versions). 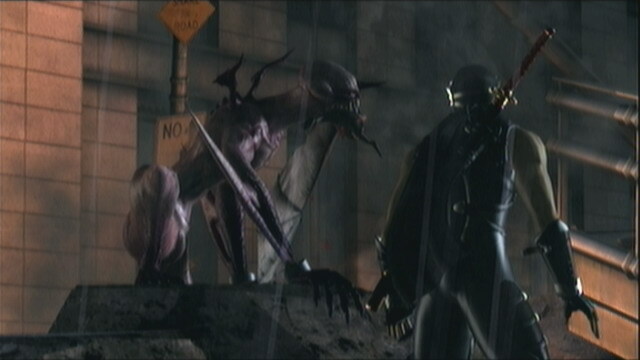 Most of the new enemies look extremely detailed, though. 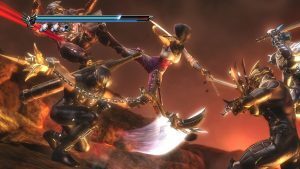 Ninja Gaiden Sigma 2 will also be remembered in the history of the PS3 for the most ridiculous use of the Sixaxis controller ever: Shaking the pad during cutscenes makes the female protagonists’ chests jiggle. No, really. It’s that embarassing. As most games for the PS3, Sigma 2 requires to be installed on the harddrive, and you get to read a prologue story to the game in form of a digital comic during the process. The collector’s edition contains a printed version of this, together with an artbook and the OST.